Sands Whitewater and Scenic Snake River Trips offer raft adventures that are the stuff of memories. Getting out on the water during your visit to Jackson Hole—specifically the magnificent Snake River—is a must-do, can’t-miss proposition. A guided scenic river raft trip or whitewater adventure down the Snake River Canyon is one of the most special and unique ways to take in the beauty and wildlife that mark this area. And why not experience the magic with the river outfitter that is the granddaddy of them all: Sands Whitewater and Scenic River Trips. Can’t decide whether to take a relaxing scenic float or a more exhilarating whitewater trip? On leisurely scenic trips you’ll only get soaked if you want to hop out of the boat and swim—the views are the only thing that should get your heart rate up. Whitewater trips also offer glorious views but are interspersed with jolts of adrenaline as you and your paddling companions maneuver the raft through rushing rapids. Sands Whitewater and Scenic River Trips offers quite an array of trip choices for both scenic and whitewater, from half day river runs to an overnight experience tailor-made for the memory books. Simply select one or the other, depending upon your group and the time you have available while in Jackson Hole. While no river trip is “standard,” Sands’ 8-mile whitewater trip is a great way to get your feet wet; pun intended! 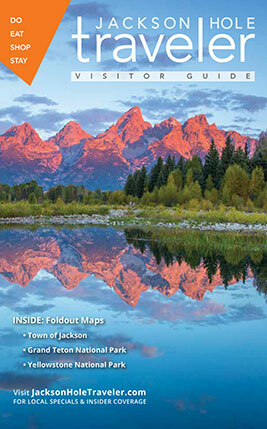 This half-day experience is over by 1 p.m., giving you the rest of the day for more Jackson Hole adventures. There is also an 8-mile scenic float with breakfast or 13-mile floats that leave in the early morning or late afternoon. Combination whitewater and scenic journeys are either 16 or 21 miles in length. Sands has one of only two overnight camps on the river. Choosing an overnight trip allows you to basically camp without the gear. Sleeping bags are provided and they go on top of cots inside custom-made riverside teepees. In the early evening, you float 8 miles down the river, eat dinner by campfire, go to sleep, then wake up, eat breakfast and start the day with an energizing 8-mile whitewater trip. The best part is that you get two river trips, two meals and a place to stay for the night for less than the cost to stay in a hotel room! Jackson Hole ski and river legend Charlie Sands started his river trip business in 1964, back when Jackson Hole was one of the few places in the world where you could experience such a fun, watery journey. One of the largest rafting companies in Jackson Hole, Sands Whitewater and Scenic River trips is also the only continuously owned and operated by its original founder, float outfitter in Jackson Hole. Even if Charlie doesn’t run the river on a regular basis anymore, he still calls the shots and even drives the buses! Sands Whitewater has taken tens of thousands of people safely down the Snake River. In fact, it was the river outfitter chosen by the White House to take both presidents Bill Clinton and Barack Obama and their families through the Snake River Canyon on whitewater trips in 1995 and 2009, respectively, and again in the summer of 2014 with Vice President Joe Biden. Being the first rafting company to bring a sitting president down a river with Class II and III rapids speaks to the level of trust in Sands’ guides and the company as a whole. Booking a river ride with Sands will afford you some pretty good bragging rights: You chose the company trusted to safely bring POTUS and his Veep on a thrilling whitewater experience! Cost: Prices for scenic tours begin at $60 and whitewater trips at $75. Transportation to and from your hotel is included. What to wear: Light, synthetic (not cotton) layers over a bathing suit or water clothes, plus shoes that can get wet; wetsuits can be rented. Dry pair of clothes for the take out. Along with the company’s excellent safety record it also boasts guides who have floated and paddled the Snake River hundreds of times. They know the river dynamics well and are knowledgeable about the flora and fauna that live along the riverbanks. Most other outfitters’ rafts for scenic tours are rear mounted, which means the guide is looking at the back of his passengers’ heads. But Sands’ boats are designed so that the boatman is standing in the middle, therefore he can swivel around and actively participate with everybody on board. This helps tremendously with the interpretive tour. Before you head out for a whitewater trip, your guide will give you thorough safety and paddle instructions. The possibility of falling out always exists, but while getting wet is a guarantee, tumbling into the river on a rapid most certainly is not. Prices for scenic tours begin at $60 and whitewater trips at $75. Transportation to and from your hotel is included. In addition to bringing footwear that can get wet, an extra pair of dry clothes, towel, sunscreen and your camera with you, make sure you bring the expectation of having a memorable river experience, courtesy of Sands! For reservations and more information, call 800-358-8184 or 307-733-4410, or visit sandswhitewater.com. Charlie Sands started his career in the valley working on the ski patrol at Jackson Hole Mountain Resort. He was there long enough to make a name for himself and have two runs named after him—the S&S couloir and Broadway Chuck.